Spontaneous pneumothorax affects about 9,000 persons each year in the U.S. who have no history of lung disease. This type of pneumothorax is most common in men between the ages of 20 and 40, particularly in tall, thin men. Smoking has been shown to increase the risk for spontaneous pneumothorax. In some instances, the lung continues to leak air into the chest cavity and results in compression of the chest structures, including vessels that return blood to the heart. This is referred to as a tension pneumothorax and can be fatal if not treated immediately. 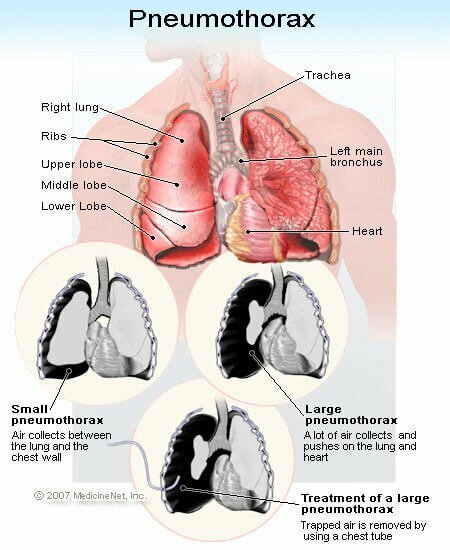 What are the signs and symptoms of pneumothorax? Symptoms of a pneumothorax include chest pain that usually has a sudden onset. The pain is sharp and may lead to feelings of tightness in the chest. Shortness of breath, rapid heart rate, rapid breathing, cough, and fatigue are other symptoms of pneumothorax. The skin may develop a bluish color (termed cyanosis) due to decreases in blood oxygen levels. Examination of the chest with a stethoscope reveals decreased or absent breath sounds over the affected lung. The diagnosis is confirmed by chest x-ray. A small pneumothorax without underlying lung disease may resolve on its own in one to two weeks. A larger pneumothorax and a pneumothorax associated with underlying lung disease often require aspiration of the free air and/or placement of a chest tube to evacuate the air. Possible complications of chest tube insertion include pain, infection of the space between the lung and chest wall (the pleural space), hemorrhage (bleeding), fluid accumulation in the lung, and low blood pressure (hypotension). In some cases, the leak does not close on its own. This is called a bronchopleural fistula, and may require chest surgery to repair the hole in the lung. What is the outcome (prognosis) of pneumothorax? The outcome of pneumothorax depends upon the extent and type of pneumothorax. A small spontaneous pneumothorax will generally resolve on its own without treatment. A secondary pneumothorax associated with underlying disease, even when small, is much more serious and carries a 15% mortality (death) rate. A secondary pneumothorax requires urgent and immediate treatment. Having one pneumothorax increases the risk of developing the condition again. The recurrence rate for both primary and secondary pneumothorax is about 40%; most recurrences occur within 1.5 to two years. A pneumothorax is a collection of free air in the chest that causes the lung to collapse. Pneumothorax may occur on its own in the absence of underlying disease; this is termed spontaneous pneumothorax. Pneumothorax may also occur as a consequence of an injury or underlying lung disease. A small spontaneous pneumothorax may resolve without treatment; a pneumothorax arising as a result of lung disease or injury requires immediate treatment. Treatment may include insertion of a chest tube or aspiration of the free air in the chest cavity.